Where were you when you found out about the death of Osama Bin Laden? I was at a neighborhood bar in Crown Heights, where a friend of mine was celebrating her birthday. The DJ had been on a roll, playing Jill Scott, D’angelo, and Janet Jackson as the birthday girl swayed and laughed. When the music cut off suddenly, everyone began to loudly voice their disapproval- until they realized that history was unfolding on the large projector screen that usually delivered sports highlights and beer specials. From then on, the neosoul interruption was immediately forgiven, and the entire bar watched President Obama’s speech attentively, alternatively expressing shock and jubilation, mostly pin-drop silent but sometimes taking moments to clap and cheer when President Obama delivered particularly juicy details or news. And I couldn’t help but notice that the men in the bar seemed to be cheering just a bit more loudly and absolutely than most of the women, especially at mentions of death and justice. At the time, I wondered if men were more universally able to accept the need for death as a means of justice in wartimes. Watching footage of celebrations outside of the White House did nothing to quell this suspicion; while the celebrations were made up of men and women, the men seemed to take a more prominent role in the revelry, climbing trees and crushing beer cans for the cameras. Now, as brought to my attention by Fishbowl NY, there’s some slightly more scientific data about reactions to Bin Laden’s death by gender. 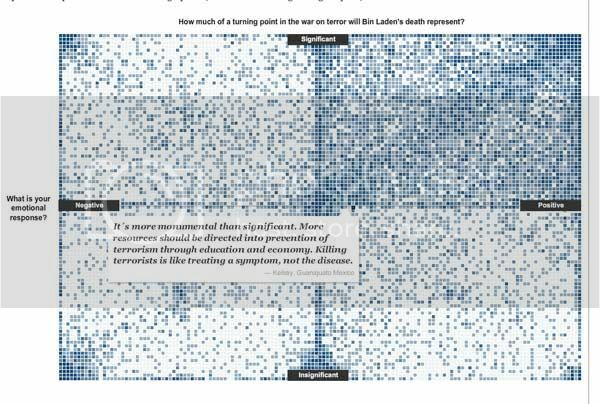 The New York Times posted an interactive graph that allowed visitors to plot their feelings on Osama bin Laden‘s death, giving them the option to position themselves on a matrix by indicating how negative or positive they viewed his death on one axis, and how insignificant or significant they viewed it on another axis. The chart is displayed after the jump (darker blue indicates more responses). While these findings in themselves are pretty fascinating, also of interest is the additional analysis offered by Dan Nguyen, a developer/journalist for ProPublica, who took it upon himself to sort these 13,000 responses by geography and gender. Since gender was not a checkbox in the NYT’s form, he used Google Refine to sort the data based on first names and assumed gender. Among all NYT website users, there was general moral approval and optimism for killing bin Laden. This did not vary significantly among U.S. citizens, whether they were from the cities attacked on Sept. 11 or elsewhere…. The 260 non-U.S.-female respondents averaged a 43 in positivity, which is a whole step below the average female response. U.S. females (2,270 of them), averaged a 52, compared to the 6,059 U.S. males who averaged a 65. These finds are interesting given the background: the raid was conducted by an all-male team (as far as we know), and left three widows who may have been killed if not for their gender, and who have now been thrust into the world’s spotlight — and hold potentially valuable intelligence information about Osama Bin Laden’s place in Al Qaeda and the role (or lack thereof) of Pakistani forces in facilitating Bin Laden’s hideout. So while I don’t think the (relative) female ambivalence can be chalked up to any one factor, I do think it’s interesting and important to consider on the whole. Feminism and anti-militarism, pro-peace efforts have a long history of overlap and commonalities. For more on feminism, women, and war, check out this awesome feminist article on demilitarization and rehumanization by Clare Bayard (courtesy of good friend and lovely blogger Kloncke), and the websites of AWID, CodePink, and MADRE. And, importantly, for more awesome reactions to Bin Laden’s death, check out the adorable video below.